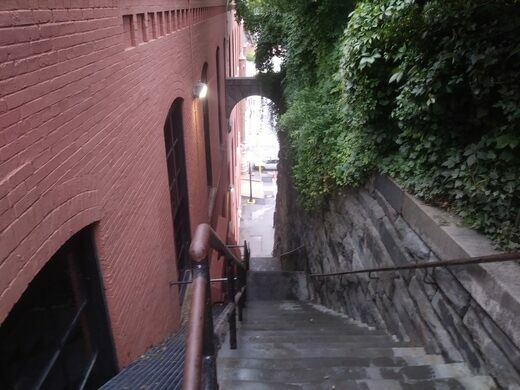 If, for whatever reason, you happen to find yourself at the ExxonMobil gas station in Georgetown where M Street becomes Canal Road, you might notice an exceptionally long, steep staircase wedged between a stone wall and a brick warehouse. 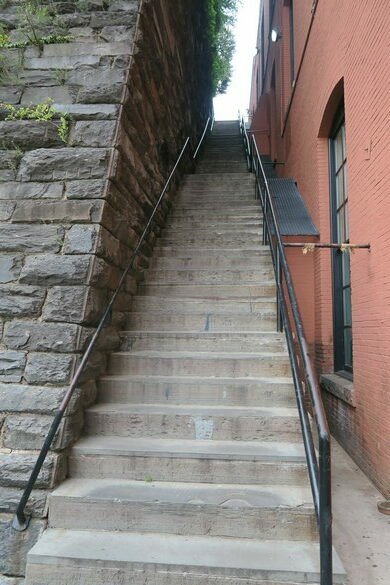 For some, these stairs might look like little more than a daunting climb, but fans of the 1973 horror movie The Exorcist will likely recognize the site of the climactic final showdown between the self-sacrificing priest and the demon who possesses twelve-year-old Regan. 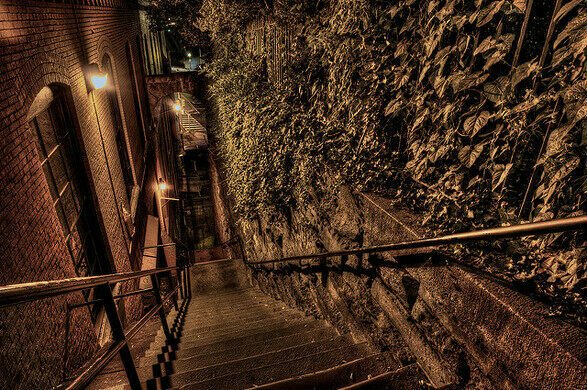 The stairs themselves, which provide a shortcut between Prospect Street NW above and Canal Road NW below, are made somewhat inherently creepy by their narrow dimensions and ivy-covered walls. The payoff upon reaching the top is minimal, revealing a rather bland concrete pathway leading to the steps. 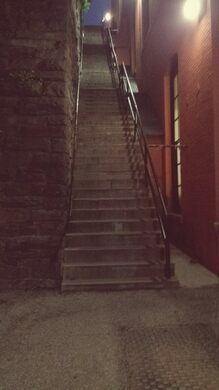 Still, it’s a worthwhile stop for movie buffs or anyone looking to incorporate a touch of spookiness into their daily workout. Update February 2019: The gas station is closed and gated off. Note there are only a few parking spots as it is a very small space. Parking is very tricky in the area. 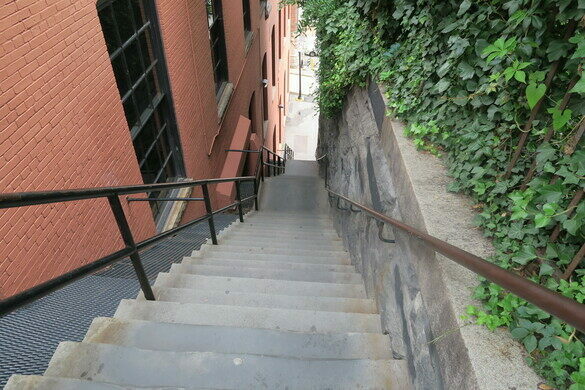 Also it should be noted that the Exorcist home from the movie is at the top of the stairs to the left at 3600. Reagan’s room built for the movie is not connected anymore, but it is the same house, behind a black gate. Drive east along M Street. Just before it turn into Canal, you will see a gas station on the right. Pull over & park in the extra parking of the gas station. 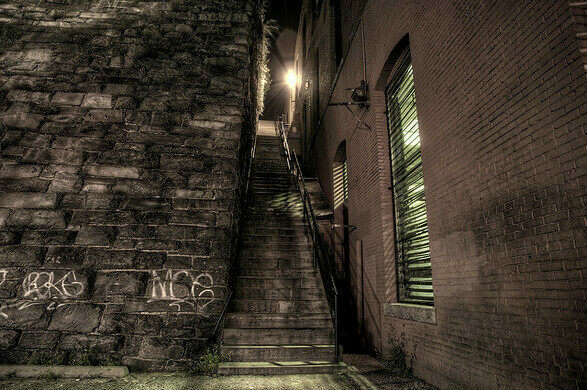 You will be right at the bottom of the stairs.